Bronson. Norris. Van Damme. Ninjas. Flamethrowers. All the things that make life worth living. Hey you — yes, you — the one reading the back of this DVD set. Got a taste for adventure and a thirst for vengeance? Need a few more explosions in your cinema diet? Look no further, friend — the Ultimate Action Collection is here to satisfy your insatiable hunger. 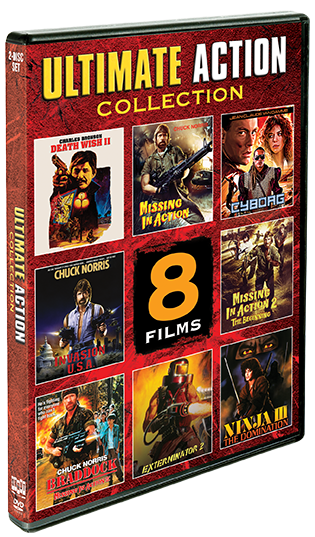 Fortified with eight times the thrills of those other DVDs you've been digging through the bins for, the Ultimate Action Collection gives you hours upon hours of booms, blasts, kicks, and Chucks! Legendary tough guy Charles Bronson returns to his signature role as the hard-as-nails urban avenger Paul Kersey. American servicemen are still being held captive in Vietnam ... but not for much longer, if Chuck Norris has anything to say about it! The intense, action-packed prequel to Missing In Action delivers even more two-fisted brawling excitement! Colonel Braddock goes back to Vietnam – but this time it's personal! Jean-Claude Van Damme is kickin' it in a plague-ravaged future. An army of terrorists versus Chuck Norris ... guess who wins? The flamethrower-wielding vigilante is back to clean up the streets of New York in a flick that's pure fire. The cult classic mash-up of ninjas, possession, and aerobics you never knew you needed.